Not travelling with a baby? Don’t run away yet! You’ll still find all the best options for transportation from the Leonardo da Vinci Fiumicino Airport to Rome city center here. When you arrive in a city, you want the cheapest and easiest way to get from the airport to your hotel without much hassle. We always like to consider all the options available for transport from airport to city center. Why? Because public transportation options tend to be much less expensive and sometimes are even faster. For Rome, the Leonardo da Vinci Fiumicino Airport (FCO) is way outside Rome (map). How do you get from the FCO airport to Rome city center or your hotel? 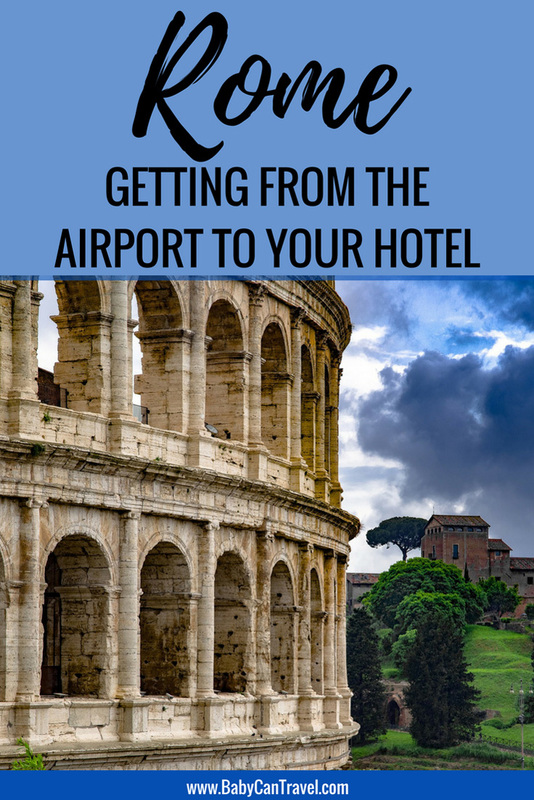 Read on for the best alternatives for how to get from airport to hotel in Rome. We have made the assumption that most people will stay somewhere in the city center. 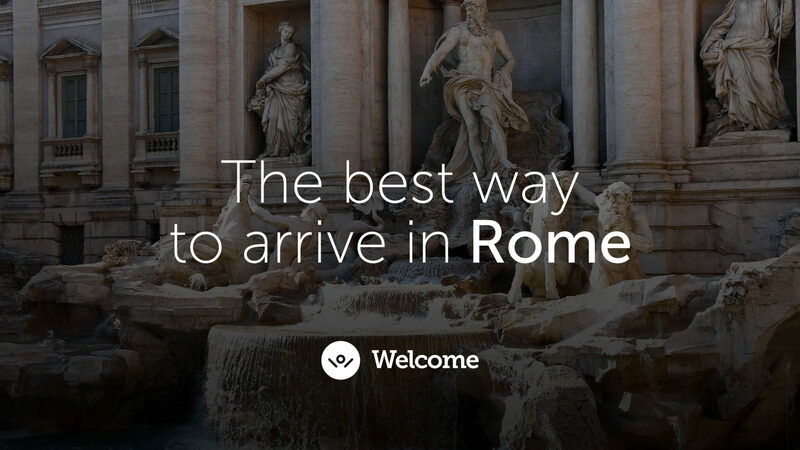 What time will you be arriving in Rome? Are Rome public transportation options feasible at this time? What is your check-in time for your hotel or Airbnb? Will you have time to waste before needing to check in? How much luggage will you be carrying? How far will you have to walk from the drop off point to your Rome hotel? Is this feasible with your luggage? What are the traffic conditions in Rome at this time? Will you be stuck in rush hour traffic or trying to fit on a packed bus at rush hour? 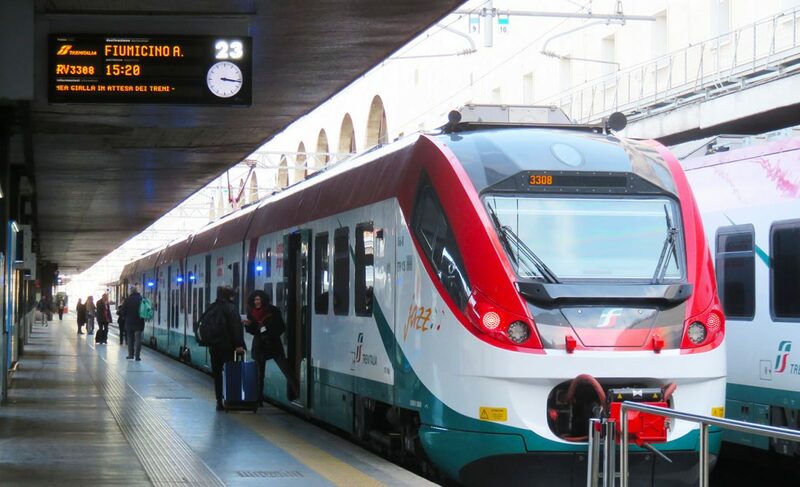 If you are heading back from Rome city center to Fiumicino airport, do you need to leave extra time for travel at peak times of day? 1.1 Getting to and from Rome airport with baby and no car seat, is it really possible? One of the trickiest parts of planning a trip with a baby is figuring out how to get around while you are there. You now need to consider whether you will be travelling with a stroller and a car seat! 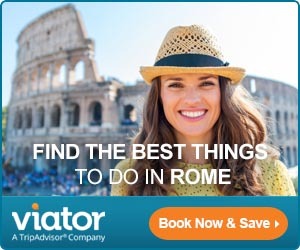 Luckily, once you are in central Rome, it’s easy to get around as it is very walkable and has reasonably good public transportation, meaning you can leave your car seat at home. The next consideration is airport transportation with car seats or finding a way to get to your hotel without needing a car seat. For more about using a stroller or baby carrier in Rome, read our Ultimate Guide to Rome with a Baby or Toddlerhere. Getting to and from Rome airport with baby and no car seat, is it really possible? So the question becomes whether you should bring your car seat to Rome. If you are only visiting Rome on your trip and you are not renting a car, then we do not recommend bringing a car seat. If you aren’t buying a seat for your baby on the airplane, it’s a huge piece of baby equipment to bring with you just for travelling in a taxi with your baby from the FCO airport to city center. Plus, hotel rooms are very small in Rome so your car seat will just get in the way. Private transfers are the most convenient method of getting transport from the Fiumicino Airport to your hotel. Instead of getting into a taxi line, your personal driver will greet you with your family name on a sign at the arrival gate. Private transfers need to be booked in advance and will generally cost you a flat fee. The personal service and convenience of a private transfer tends to cost a little bit more than a metered taxi. One such airport private transfer service in Rome is Welcome, which provides airport transfers from Fiumicino to city center starting at €48 per trip. Welcome is baby-friendly and offers complimentary infant car seats if requested at time of your reservation. In addition to your airport transfer, Welcome even simplifies your trip planning by offering essential products (such as local SIM-cards or mobile hot spots) and experiences (such as tours, day trips, restaurant suggestions, etc). For those travelling with a baby in Rome and want a transfer from the Rome airport with a car seat, then a private transfer booked in advance is the easiest way to do that. 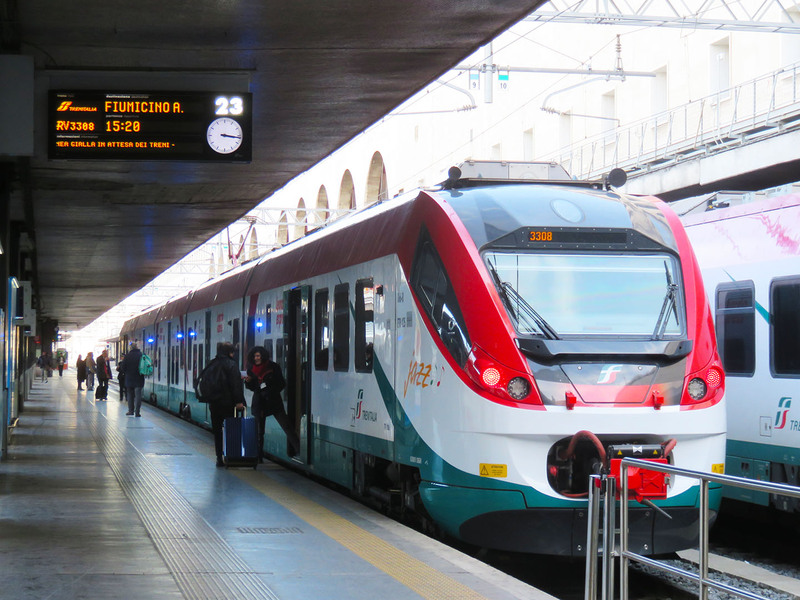 The Leonardo Express provides train service from FCO to the Roma Termini. This trip takes approximately 30 mins and tickets starting at €14 per person. Children under 4 travel for free without a reserved seat. The Roma Termini is centrally located (MAP) and from here you can walk, take the metro or the bus or risk a shorter taxi ride without a car seat. We do not recommend taking your baby in a taxi without a car seat, however taxis are typically exempt from the mandatory car seat requirements. We have done it on occasion where the other options were not feasible. For those travelling with a baby or toddler in Rome, you do not need car seats for the train. Click here to buy your Leonardo Express tickets in advance. Terravision operates a bus service from the Fiumicino Airport to the Roma Termini. At €5 per person, it is your cheapest option to get to from the Rome Fiumicino Airport to city center, but it is also the longest option taking approximately an hour. 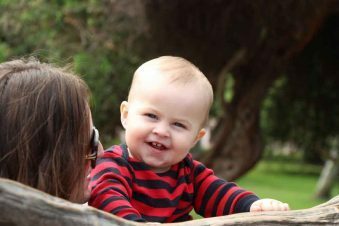 Children under 4 travel for free. If you have the extra time or on a budget, this option is a fraction of the cost of a car service with child seats. Click here for more information on Terravision. A shuttle from Fiumicino airport to Rome is the only non-taxi airport transfer in Rome where you get dropped off at the door of your hotel (or a nearby stopping place). This shared van service entails a passenger van waiting at the FCO airport until it has collected enough passengers to fill the seats. The driver will then drop everyone at their hotels in the most efficient way possible. How long this takes is a bit of an unknown, as you don’t know how long you have to wait at the airport before the van is full and you also do not know if you will be dropped off first, last or in the middle. Shuttle Direct offers this service for €11.50 per person and this is a great option for anyone traveling solo from Fiumicino airport to Rome. For families, we would recommend one of the other options to get from FCO airport to Rome city center or your hotel. The question is, do airport shuttles provide car seats? Typically not, but it never hurts to ask. Keep in mind, these shared van services would likely fall under the exempt rule similar to taxis when it comes to mandatory car seat requirements. For Shuttle Direct, babies are not free and car seats are not available. Given a family of three costs €34.50, we’d splurge and spend a little extra on the safety and convenience of a private transfer to travel in Rome from airport to city center. Click here for more information on Shuttle Direct. Taking a taxi from Rome airport to city center is normally easy – simply show up at the airport, get in line and grab a cab. Unfortunately, travelling in a taxi with a baby isn’t as simple if you want to travel in the taxi with a car seat. Can you get a taxi with a car seat? Since a licenced taxi cannot be pre-booked you can’t be guaranteed that you’ll get one with a car seat. The total cost of a taxi from Rome airport to city centre is currently a fixed rate of €48. When we traveled to Rome with small children, we ended up taking the airport bus to the Roma Termini, followed by a public bus to our Airbnb apartment. We chose this option as our flight arrived well before our check-in time at our central Rome Airbnb apartment, so we were not in a rush. Had we been able to check in right away, we’d likely have opted for the convenience of a private transfer.